CARGO Double Agent Concealing Balm is a luxurious concealer duo which instantly camouflages imperfections and highlights your best features. 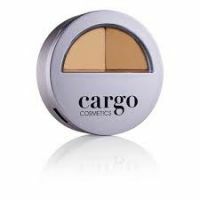 Featuring a balmy concealer and soft setting powder, Double Agent Concealing Balm is enriched with the perfect balance of Oils, Butters, Vitamins and Pigments to soothe, nourish and hydrate the skin whilst combatting dark circles and blemishes. The creamy balm texture blends imperceptibly into the skin for ultimate comfort and coverage whilst the soft setting powder ensures lasting wear and a natural finish. Double Agent Concealing Balm leaves the complexion looking beautifully flawless with a touch of luminosity for a youthful boost.